Back when I was younger, Worms was a great way to get my fix of cartoon violence. You placed your character in a strategical position on a map and would then fire missiles/guns/nukes at opposing worms. Whoever dies first loses. Recently launched onto Google Play is Blastron, a game with the same modus operandi, but with robots instead of war-hardened worms. 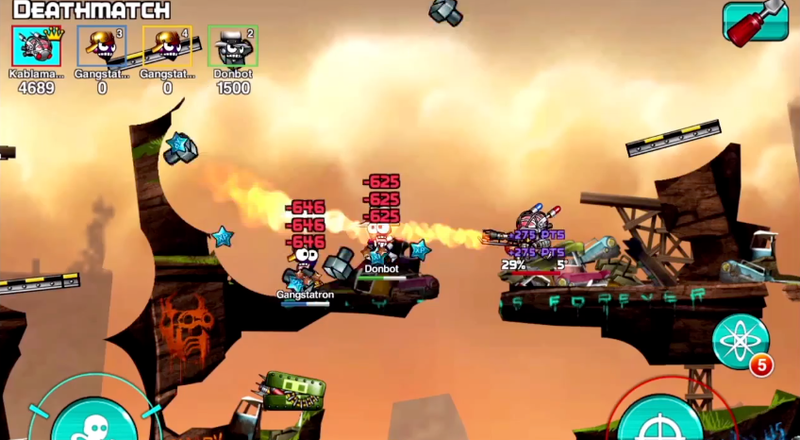 As you progress, your robot is heavily customizable with different weapons and power-ups. The game is free, but there are a ton of in-app purchases to give you the upper hand against online opponents. For fun, I gave a quick look at the app’s page on the iOS AppStore. Listed as one of the top selling in-app purchases is the $100 “Vault of Gears.” $100?! People must be crazy for this game. Literally crazy.